The house is designed as a weekend retreat for a young filmmaker and his family. 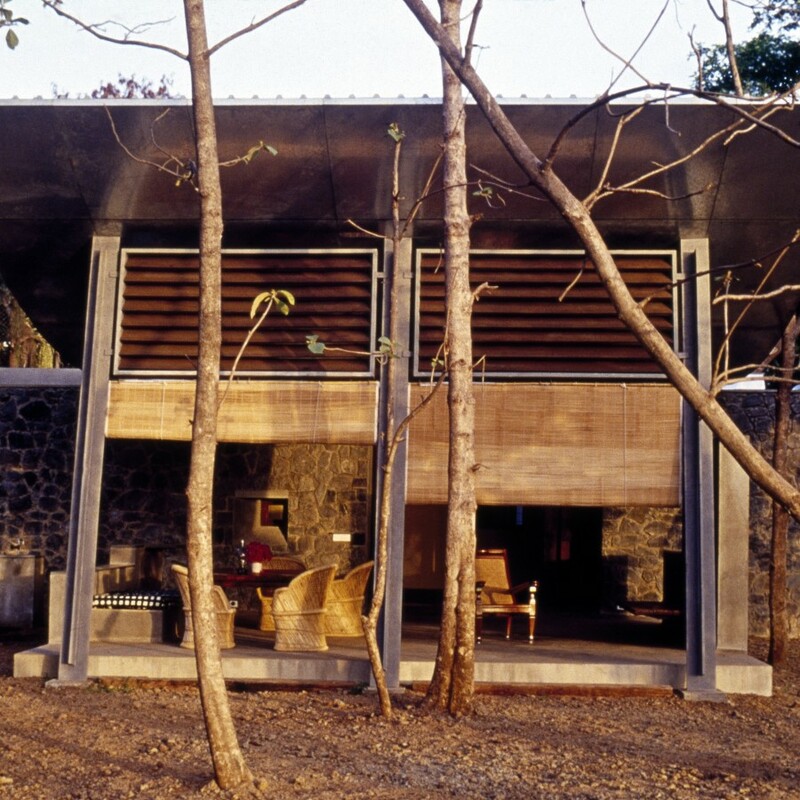 Situated on a one-acre plot in the village of Kihimin Alibaug (across the harbor from Mumbai), the location of the house on the site divides the plot into two distinct zones – one which comprises predominantly of teak wood trees and the other accommodating a manicured garden. The ‘living room,’ which is really a large verandah, opens onto the teak wood zone while the bedrooms overlook the area with the garden. This zoning of the site also creates a distinct public and private face for the house, which is expressed in the finishes, and levels of transparency in the different spaces. 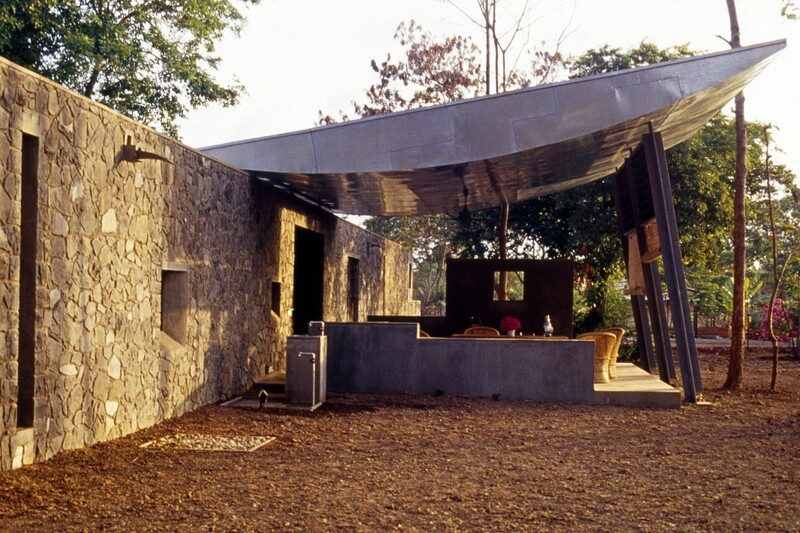 Local Basalt stone is used for the walls with a form-finished slab in concrete for the circulation area and an inexpensive galvanized metal for the roof – materials commonly used in the area. When the house is not in use, during the weekdays, the living room (or verandah) is like an offering to the local villagers who have been given access to it. This softens the social threshold between the urban occupants of the house during the weekends and the villagers of the locale where the house is situated. 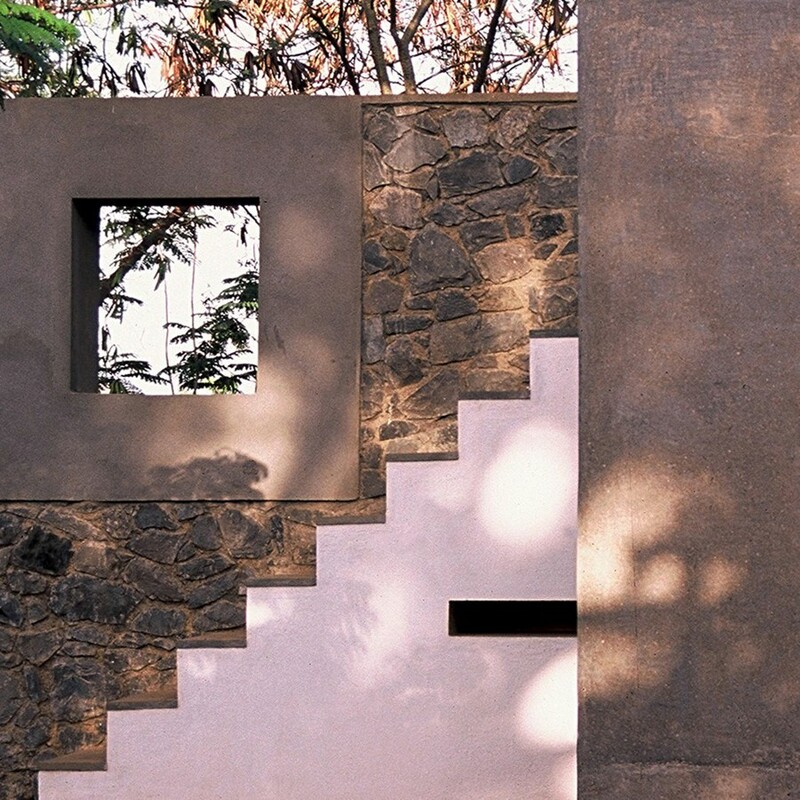 This was an important concern because these areas on the periphery of Mumbai have become sites for the urban rich to create lavish weekend homes – thus setting up uncomfortable and often tense polarities with the local rural inhabitants. The interspersed small courtyards in the central spine create a stunning modulation of light through this space. 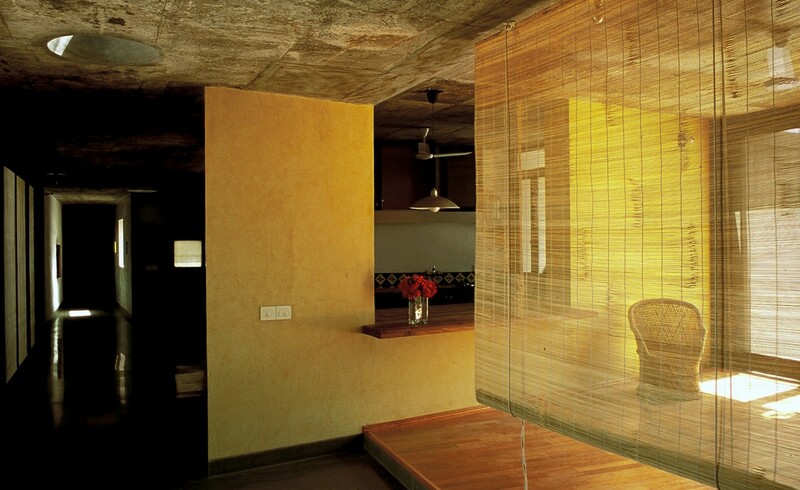 Furthermore, by adjusting openings along the circulation spine, the many variations of light are possible. 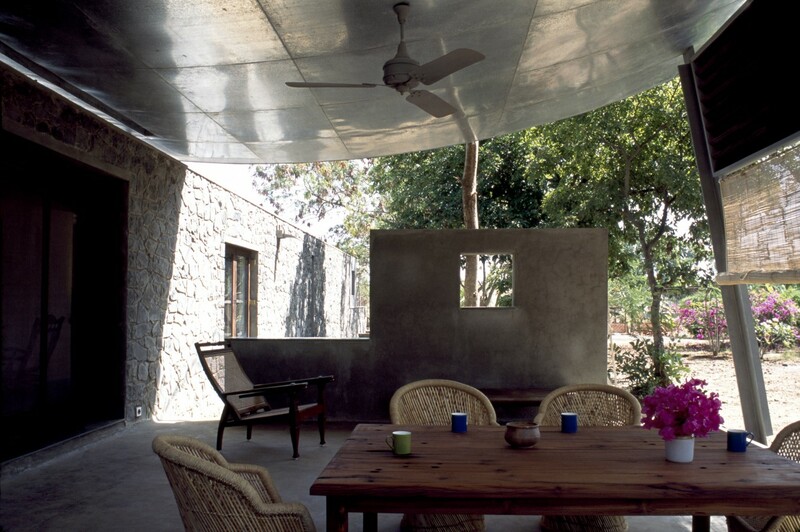 This series of courtyards within the house also facilitate ventilation thus achieving an effective passive air-conditioning within the house. 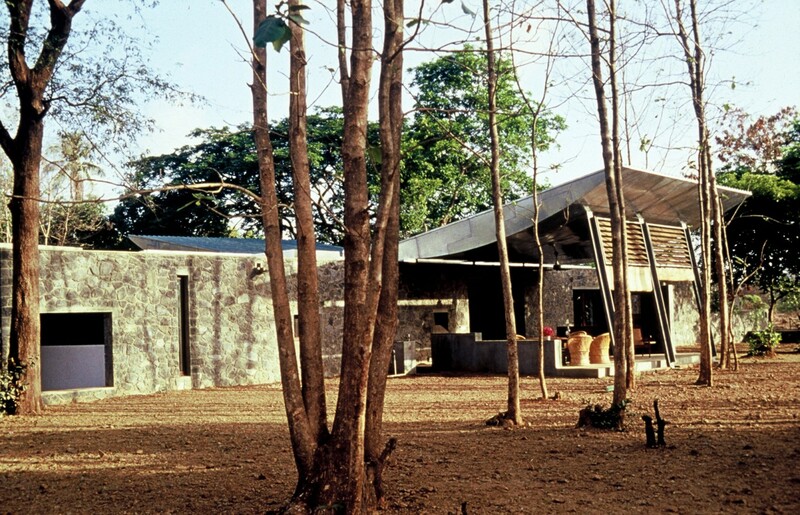 The configuration of the inward sloping roofs deposit rain water on the slab over the circulation areas (which acts as a large channel) and is sloped toward an existing well, which then gets recharged by this system of water harvesting.